Choose a puppy from the kennels. Name it, train it and take care of it. 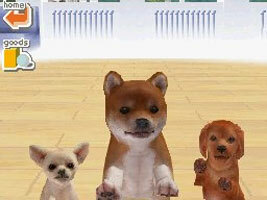 There are three versions of the game, each with five different puppies available to choose from at the start. Use the stylus to pet your puppy and to interact with a large number of toys. You can train your Nintendog to respond to pet calls by speaking into the microphone. You can also take it for a walk and train it to take part in a dog show. When you wirelessly link two or more DS systems, your puppies will play with each other in the same room. You can also trade puppies from other copies of the game. Each copy of Nintendogs has a different remote control Mario Kart toy you can buy for $100. Dachsund & Friends has Mario, Chihuahua & Friends has Bowser, and Shiba/Lab & Friends has Peach. The ? Block and Rubber Mushroom are based on sprites from Super Mario Bros. The Red Hat and Green Hat accessories are Mario and Luigi's hats from the Mario series. One of the Music items you can get in the Chihuahua version only is the Mario Music Box. This plays the Super Mario Bros. theme tune. The Frisbees have the Nintendo logo on them. When you visit the secondhand shop, you can see the layout of the shop on the top screen. On the right hand side is a stuffed red Bulborb from the Pikmin series. You can make it out in some of the other shop scenes as well. When walking your dog, one of the random dog-walkers you bump into is named "Shiggy" and his dog is named "Pik". This is based on Nintendo game designer Shigeru Miyamoto, and his real-life dog, who is also named Pik.